All the headlines will be about Morgan Schneiderlin, with his two goals and his dominance of midfield, but for me the story was all about Ronald Koeman and how he turned Saints rather ordinary first half into a completely dominant second half. This is a man with a plan B and very probably a plan C as well. The Saints line up looked very attacking, with the only change from the previous week’s goalless draw against West Brom, being Shane Long starting for Wanyama, who dropped to the bench. From the beginning Saints looked to have not quite clicked, although West Ham looked worse. When West Ham did score, just before the half hour mark, it was very much against the run of play. Zarate caught Schneiderlin dozing in midfield and found Noble, whose shot from way out was unfortunately deflected past Forster, off the unfortunate Maya Yoshida’s outstretched foot. West Ham looked unable to cope with the Saints midfield and Pellè had a shot cleared off the line before the equaliser finally arrived, shortly before half time. Tadić took a free kick on the left and found Schneiderlin. Although his first shot was blocked, it rebounded to him which he curled in to the top corner. I don’t know what Ronald Koeman said, but after the break Saints were in almost total control. Just look at the stats on the right for confirmation. The West Ham goalie was kept very busy, making saves from Long and Tadić, before the second Saints goal came. Saints won a free kick near the halfway line and Tadić found Gastón Ramírez who appeared to head the ball, but unfortunately over. The referee then gave a corner, saying that the West Ham number 8 was the last to touch the ball. While the home team’s players were still arguing with the ref, Ward-Prowse took a quick corner to find Schneiderlin at the near post, who tapped the ball home. 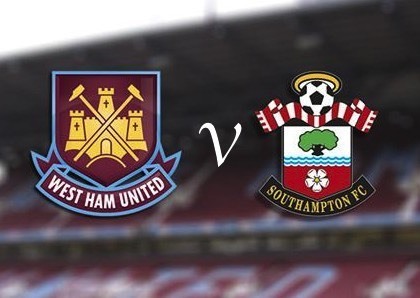 Rather than galvanise West Ham into action, they actually looked a beaten team and Saints were ripping them apart. Pellè in particular was having a good game and had already had one attempt ruled offside, when he eventually got his first league goal of the season and Saints third of the day. Some wonderful approach work by Jack Cork and Clyne caused panic in the defence and the ball rebounded to Pellè, who calmly thumped the ball into the roof of the net. As he was making contact with the ball Gastón Ramírez somehow ended up in the West Ham net, but it rounded off a very successful afternoon. It seems that this team is starting to knit together and the change in style is both easy on the eye and seems that it might be exactly what Gastón needs. When he came on he was in the thick of things and linked well with the other players. Shane Long probably needs a couple of weeks to get used to Koeman’s brave new world, but the early signs are encouraging. He really needs to strike up a partnership with Pellè, who is clearly getting to grips with life in the Premier League. I noticed that the West Ham scorer, Noble was complaining on social media that he just couldn’t tackle Pellè, he just bounced off him.